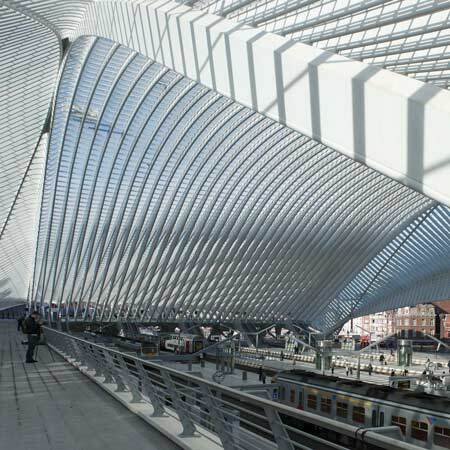 Spanish architect Santiago Calatrava has completed a station with a vaulted glass and steel canopy in Liege, Belgium. The new station was officially opened on 18 September 2009, with a show by Franco Dragone. Monumental and expressive, airy and transparent, it is the work of the engineer and architect Santiago CALATRAVA. It is already asserting itself as a symbol of the city’s renewal and as one of its most prestigious visiting cards.It has 9 tracks and 5 platforms (three of 450 m and two of 350 m) with ultra modern glass and steel façade like ribbed roof. All the tracks around the station have been modernised to allow high speed arrival and departure of trains. The new station is made of steel, glass and white concrete. It includes a monumental arch, 160 metres long and 32 metres high. Called Liège-Guillemins station, the project links two areas of the city previously divided by railway tracks. 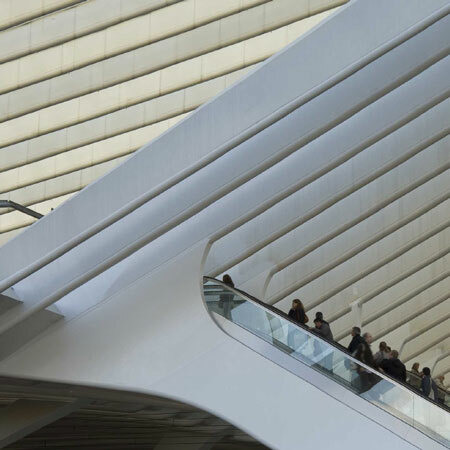 As is usual of Calatrava's buildings, it was very expensive to build- €312 million. In 2006, the ECSN (European Concrete Societies Network) made no mistake in giving its Award for Excellence in the Buildings category to Liege-Guillemins station. This prize rewards a project in which the use of concrete is both exceptional and innovative. It was the first time a structure had received such a prize in Belgium. Calatrava aimed to enhance this permeability by creating a building without facades, relying on the roof for shelter and the building's identity. The canopy covers five platforms and extends over 145 meters. Engineer and architect: Santiago CALATRAVA.